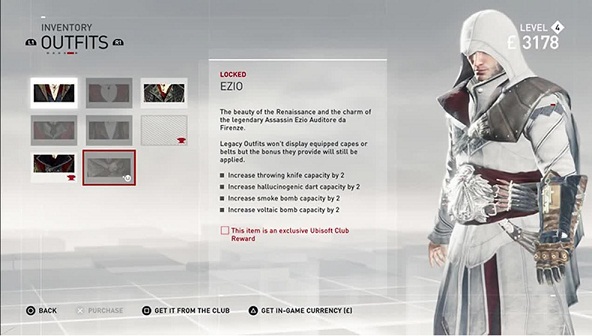 You can get Ezio’s outfit either as an exclusive Ubisoft’s Club Rewards or with in-game currency. Requirement to unlock is that you must have played a game from the series, and this with a Uplay account has been linked. All matches up to the first part count because Uplay was introduced later. Then you get the Ezio's costume for free in the new offshoot. Unfortunately, while wearing the Ezio costume your belt disappears. Its effect, however, remains still exist.